In the Roman period shoes had separate soles which were hobnailed to the upper, and from the late sixteenth century shoes were welted, i.e. 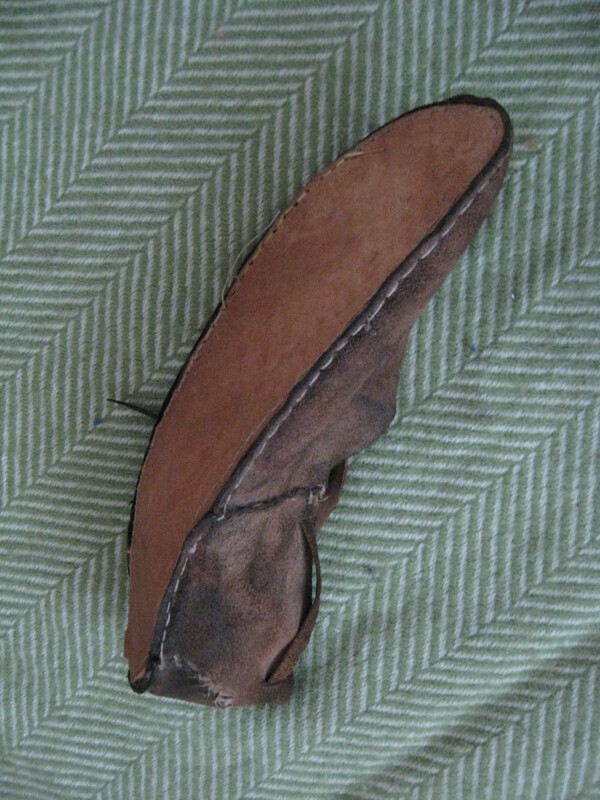 the sole was attached to the upper using a leather strip. In the intervening period, shoes are “turned”, which means that the upper and sole are sewn together while the shoe is inside out, and the shoes is then turned the right way so that no stitching is visible on the outside of the shoe, protecting the stitching from wear. 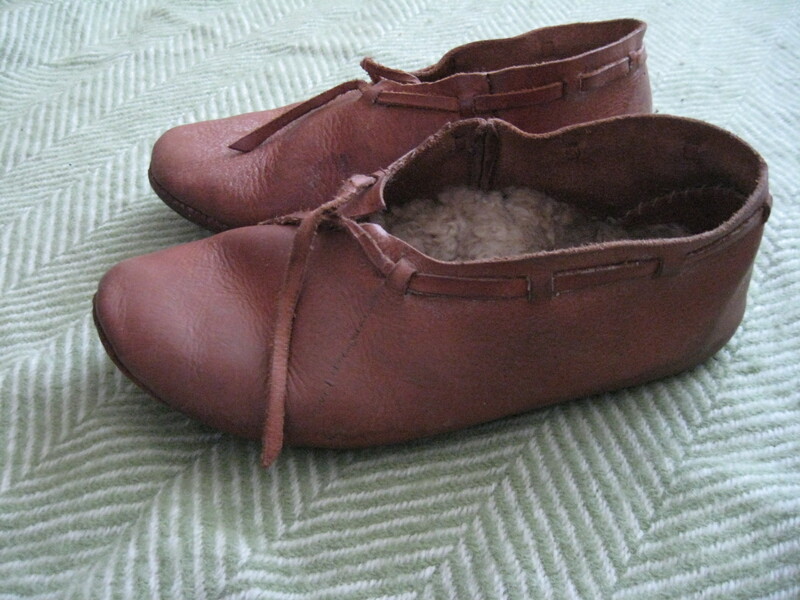 The shoe pictured below shoes a shoe turned out so a new sole can be attached. In Britain, we have a large number of finds dating from 850 onwards. Shoe styles from 850 to the Norman Conquest seem to change very little. 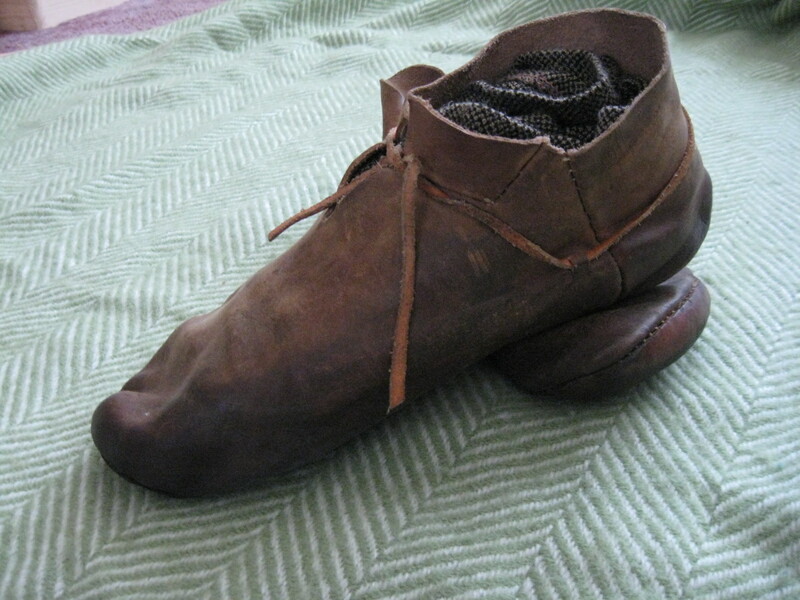 Pre-Conquest, there are two basic types: Scandanavian period shoes tend to have a V-section heel extension on the back of the sole stitched into the back of the shoe, but between 900 and 1000AD this changes to a round, “modern” shaped sole with a heel stiffener, possibly simply because these are easier to produce than the earlier style. 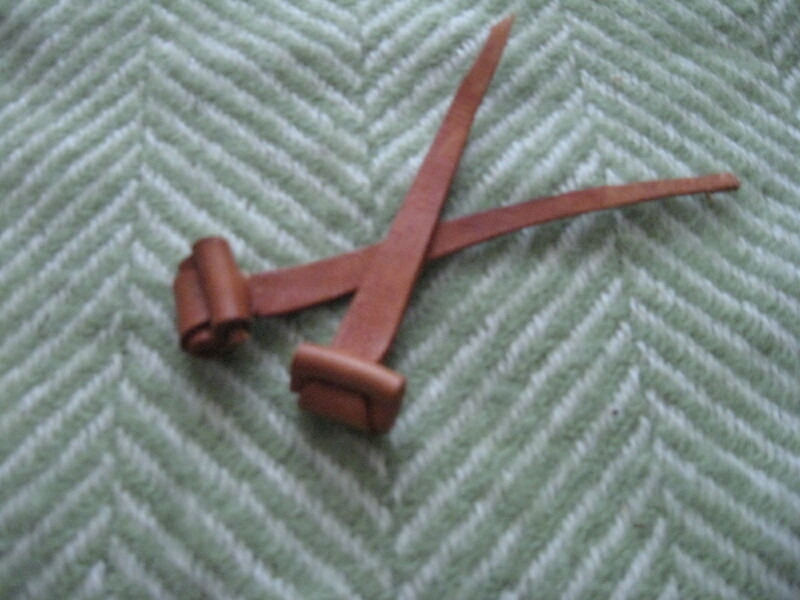 At roughly the same time, toggles seem to fall out of fashion as a means of fastening shoes, and drawstrings become more common. Throughout this period, shoes mostly come up to the ankle bone or lower. As with many aspects of life and clothing, post-Conquest shoe styles appear to change frequently, presumably according to court fashion. Over the course of the following five hundred years shoes will vary significantly in height, length, fastening style, and practicality. 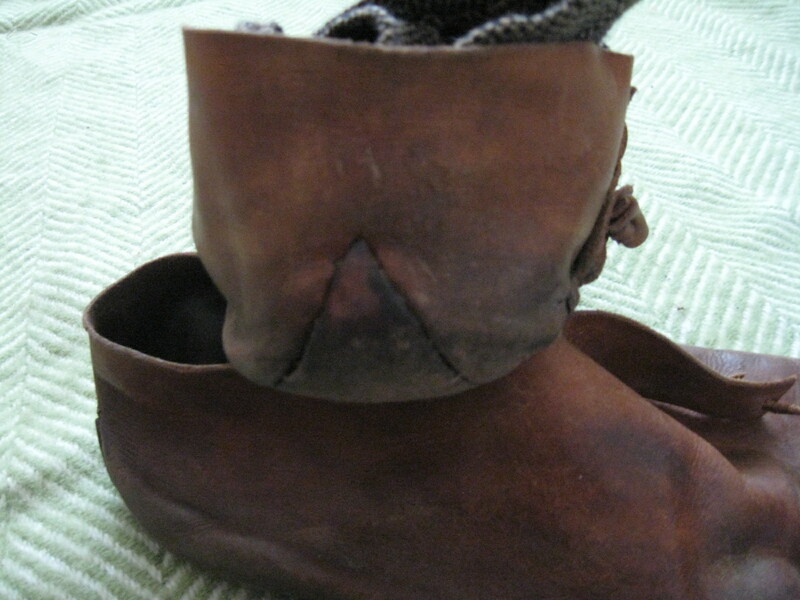 Below is an example of a post-Conquest boot. As you can see, unlike earlier styles this would come to above the ankle. 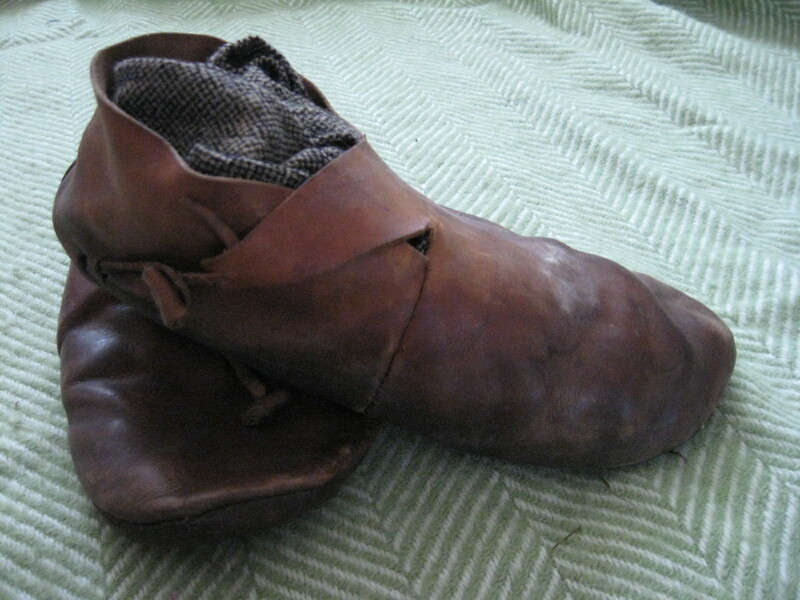 Although it seems likely that in towns shoes were frequently bought from shoemakers, some would have been produced in the home, and many would have been repaired at home. 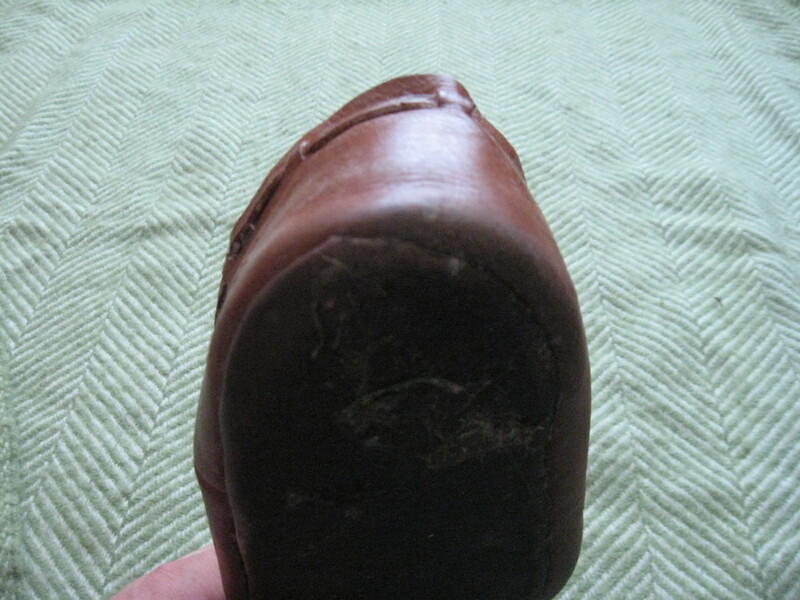 Many finds show signs of repair, and in fact many finds are of the sole alone, because uppers tended to last longer and therefore several soles might be wear out and be discarded for each upper. 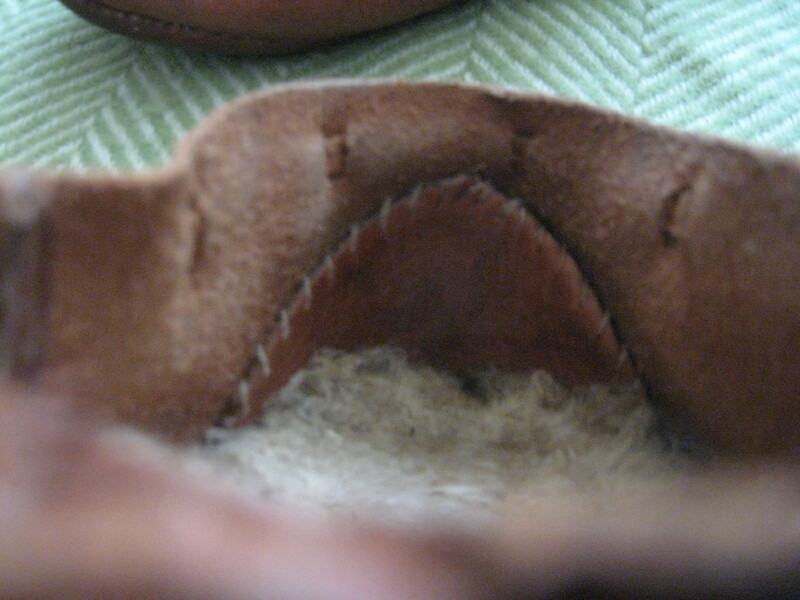 Large numbers of soles were repaired with a “clump sole”, i.e. by simply patching the hole. Other repairs include patches sewn into uppers, and toggles moved and slits added to improve the fit. Even once a shoe had reached the point of no return and could not be mended further, the leather itself would be reused for e.g. small knife scabbards and an archer’s brace. Other shoes show signs of adaptation for foot problems, primarily by slitting the upper or cutting sections out of it to relieve pressure on sore areas.